As there will be surprise entrants shall we say bonus points for any unannounced picks we include anywhere in our 30 eliminations for men and women? As there is no entrant picks included in this predictor. Jericho(not really) - Finn Balor. I did'nt even realise till i was going over it again. Same reason I didn't go for Nakamura too. I can't see them having two Japanese winners, so went for Finn, thinking he'll move to SD and challenge AJ, some kind of Bullet Club angle. 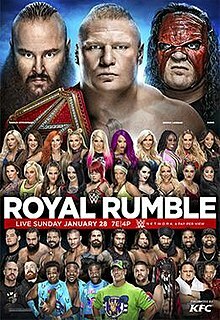 Ever since Balor fOreVER it has felt like the pay off could be the Rumble. Winners pose "even 29 other men can't get me OVER"